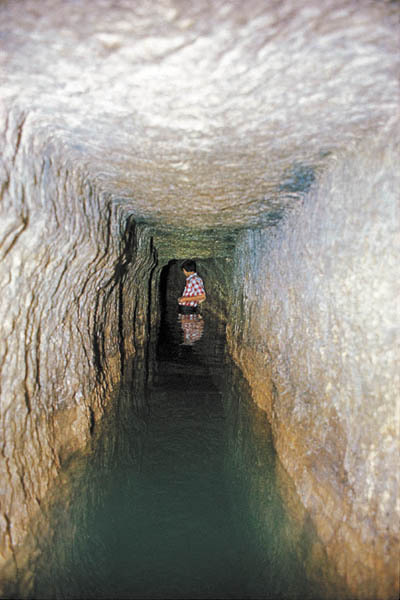 A young boy wades through Hezekiah’s Tunnel, the most famous of the Jerusalem tunnels. The image brings to mind the discovery of the Siloam Inscription—located at the southern end of Hezekiah’s Tunnel—by a youth in 1880. The first argument for re-dating the tunnel concerns the Siloam Inscription. Found at the southern end of Hezekiah’s Tunnel, the Siloam Inscription recounts how the men digging the tunnel worked in two directions—one from the north, the other from the south—and met in the middle. The Siloam Inscription does not name Hezekiah or Sennacherib I, the Sennacherib in the Bible, which would simplify matters. While most scholars attribute the Siloam Inscription to the Iron Age II, John Rogerson and Philip Davies argue that it is actually Hasmonean, which raises the question: Which period is a better fit for the Siloam Inscription? As described in the Siloam Inscription, Hezekiah’s Tunnel was dug by two teams, who worked in opposite directions and met in the middle, to prepare for the invasion of Sennacherib. In the Bible, this impressive feat is detailed in 2 Chronicles 32:2–4. The final argument hinges on the relationship of the various channels of the water system in Jerusalem. Tunnels were dug in very different periods, ranging from the Middle Bronze Age to the Second Temple period. 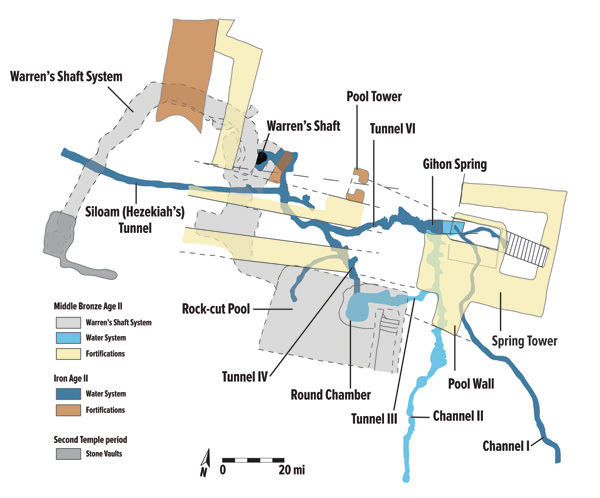 Ronny Reich and Eli Shukron, who have excavated the City of David near the Gihon Spring extensively, believe that the starting point of Hezekiah’s Tunnel was Tunnel IV, which is connected to the Round Chamber of the Rock-cut Pool. At the entrance to Tunnel IV from the Rock-cut Pool there is a place that had been smoothed for a plaque. The similarity between this plaque and the Siloam Inscription supports the idea that Tunnel IV marked the beginning of Hezekiah’s Tunnel, just as the Siloam Inscription marked its end. In Jerusalem, tunnels—numerous and crisscrossing—of the water system are difficult to keep straight, but through their excavations in the subterranean levels of the City of David, Ronny Reich and Eli Shukron have mapped out the Jerusalem tunnels. 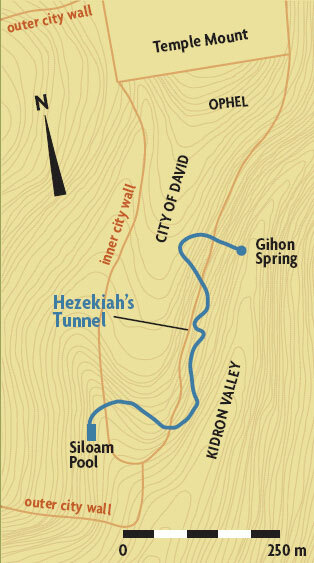 The Siloam, or Hezekiah’s, Tunnel connects to the Gihon Spring via Tunnel VI. Reich and Shukron believe that the starting point of Hezekiah’s Tunnel was in Tunnel IV. A house built on top of rubble fill, which blocked the entrance to Tunnel IV, was found in the Round Chamber. Some of the pottery in the fill under the house dates to the late ninth–early eighth century B.C.E. (Iron Age IIa)—which predates the time of Hezekiah by nearly a hundred years. Based on this pottery, Reich and Shukron date the house to the late ninth or early eighth century B.C.E. as well. According to the rules of deposition, Tunnel IV and Hezekiah’s Tunnel had to predate this house since debris underneath the house were used to block Tunnel IV. Additionally, if the two channels had not been dug, water would have continued to flow into the Rock-cut Pool, and the house would have been underwater. On this basis, Reich and Shukron argue that Tunnel IV and Hezekiah’s Tunnel must have been constructed by one of Hezekiah’s predecessors, dating as early as the time of King Jehoash (835–801 B.C.E. )—a century before Sennacherib’s siege of Jerusalem in 701 B.C.E. Is Jehoash actually responsible for “Hezekiah’s” Tunnel? BAS Library Members: Read Hershel Shanks’s full article “Will King Hezekiah Be Dislodged from His Tunnel?” by BAR as it appears in the September/October 2013 issue of Biblical Archaeology Review.